If you’ve watched any political coverage on television in the last few months, or the Olympics, or really anything on TV, you’re bound to have seen some pretty ridiculous advertising coming from the oil and gas industry. The American Petroleum Institute in particular has been putting out some pretty desperate stuff. Did you know that “A Vote for [Fossil Fuel] Energy is a Vote for Cheesesteaks?” That’s actually the title of one ad put out during the Democratic Convention, which was held in Philadelphia (Get it? Cheesesteaks!). Did you know that if you really love your mother, then you love fossil fuels? That’s what API would have you believe in its ad titled, “A vote for mothers is a vote for energy.” (They say flowers need a lot of fossil fuel energy to be produced…and we all know that all mothers want are flowers…?). And there’s more: A vote for [fossil fuel] energy is apparently a vote for summertime pool parties? And in perhaps the most brazen contention, the API — the organization that spends millions each year on lobbying, political advertisements, and campaign contributions — suggests that a vote for [fossil fuel] energy is a “vote for democracy” itself (just ignore the fact that the ad itself barely mentions anything related to the democratic process). Putting aside the comical nature of these ads for a minute, let’s have a look at what API is actually promoting. Rejecting recent guidance from the White House on how to incorporate climate impacts into environmental impact statements. In summary, they want more oil and gas production everywhere, and no regulations to protect communities or the climate anywhere. 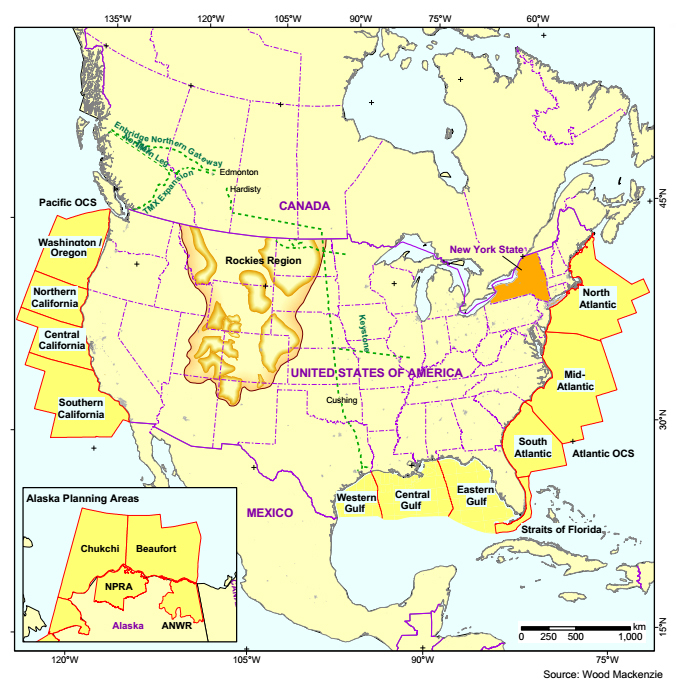 This map below, reproduced from an API document, shows that the aim is to drill the entire United States coastline, including the Alaskan coast, as well as all of the Rocky Mountain region treasured by so many Americans. Indeed, this goes to the heart of the insidiousness of the API’s public relations campaign. Not only does the campaign mislead viewers that oil and gas are the only energy sources that can provide for America’s needs, but also that the everyday people portrayed in the ads support the reckless drill and pollute agenda that the API is pushing. Recent polling from Gallup shows that 60% of Americans support conservation over fossil fuel production, and 73% believe emphasizing alternative energy over fossil fuels is the answer to the nation’s energy future. Clearly the API has a long way to go to convince Americans of its dirty agenda, which is probably why they are resorting to such insipid advertising. The API’s demands would, in its view, lead to a 22% increase in production across both oil and gas in 2035. This is a climate disaster that we cannot allow to go forward. If the API had its way, the United States would be producing oil and gas in 2035 at a rate that would equate to 315% more than the U.S. stated climate goals. 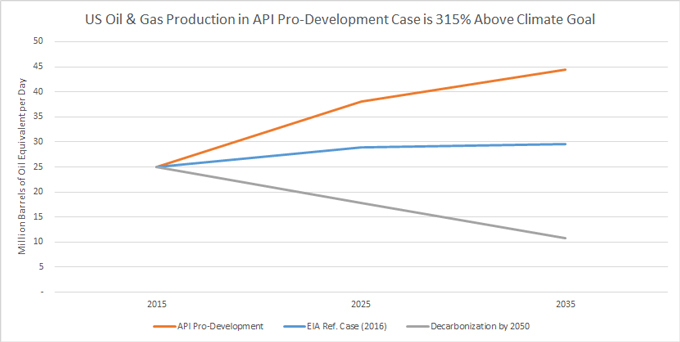 The chart below compares the API’s pro-fossil fuel-development agenda against two scenarios. The blue line is the Energy Information Administration’s (EIA) Reference Case, which we’ve previously shown would equate to some 4 to 5?C of global warming, otherwise known as climate catastrophe. The grey line is a pathway towards decarbonization by 2050, which is required if we are to solve the climate crisis. The fact is that our energy landscape is changing and the API is running scared. Clean energy technology, like wind, solar, storage, efficiency and demand response, is steeply declining in price and skyrocketing in production. Electric vehicles are rapidly becoming competitive and poised to change mobility forever. The cleantech sector is attracting record investment, $329 billion in 2015, while the oil and gas sector shrank and shed jobs. As Bloomberg recently put it, wind and solar are crushing fossil fuels, as investment in 2015 was double that of oil and gas. So when it comes down to it, the American Petroleum Institute and the oil and gas lobby it represents, are desperate. They want to clutch onto the past while the world changes around them, and the public really isn’t buying it. We’re ready to move on towards a clean energy economy and leave oil and gas — and their ridiculous advertisements — in the dust. Just so we may be reminded. I think Solar,Wind, and electric autos, are away to the future. But to give up on oil and gas. A transition like that, is far, far away. Safer metheds of obtaining oil and gas should be worked on. I would like to see parts of NY open to fracking. But I would like to see it, safely.